Heat oven to 350°F. Pour soup into 2-cup measuring cup or bowl. Stir in onion powder, garlic powder and ground chipotle chiles. Spray insides of 2 ovenproof 2-cup bowls with cooking spray. Place 1/4 cup corn and 1/3 cup chicken in each bowl. Pour about 1 cup soup mixture evenly into bowls. Carefully place 2 cheese slices in center on top of soup in each bowl. Sprinkle 1 tablespoon roasted peppers evenly around cheese in each. Place biscuits over cheese; spray biscuits with cooking spray. Place bowls on cookie sheet; bake 38 to 43 minutes or until biscuits are golden brown and soup bubbles around edges. Cool 5 minutes before serving. 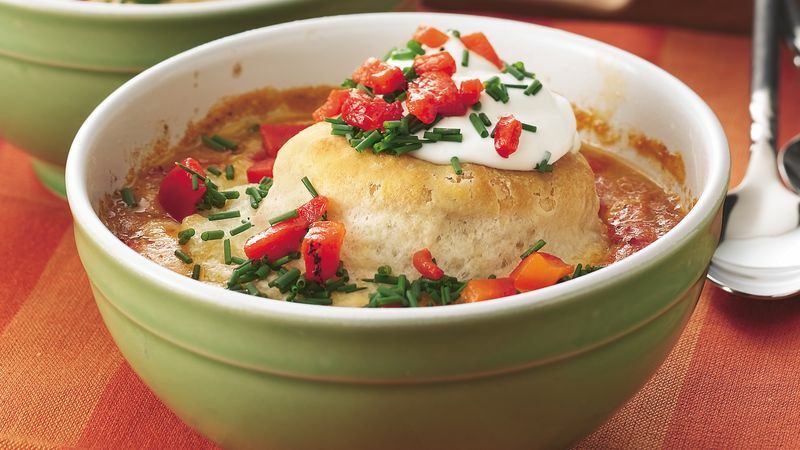 Serve topped with sour cream, chives and remaining tablespoon roasted peppers.